Looking for a larger mug? The personalized Sport Mug is just what you need – it is 7 inches tall and holds 25 ounces. 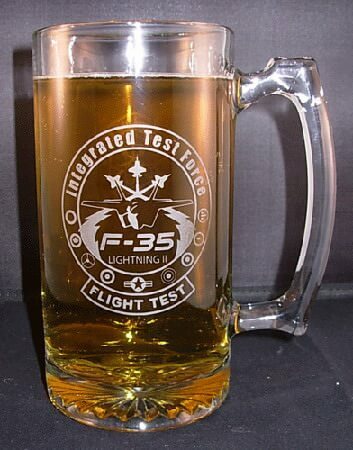 This beer mug is perfect for intricate engraved artwork as it has a very large usable space. The bottom of the beer mug has a neat and classic "starburst" effect and the top of the handle has a patterned thumb rest. Personalization, text and/or design, on the front of the custom beer mug is free, other options are available for an additional fee. We suggest keeping your text to 5 lines of 20 characters per line, it is okay to go over, it may just be smaller to fit it on the glass.